It’s our 400th episode! Thanks for the support. All Maz plugs must be pre-approved, T.J. Miller is next up, bad pizza jokes, Macomb Co Clerk house of skank & we have the best listeners. Tom is fuming over the discussion of Starbucks, even though he won the poorly worded Twitter poll. He does make a major admission about the meeting we have Thursday. Don’t ever complain about your co-workers again. At least they don’t like ISIS. Trudi calls in to give a blanket apology for everything in 2017. Since Tom hates Starbucks, LA Fitness, Lucky Strike etc… What are the most hated companies? J. Paul Getty might have been a worse person than the guy that was supposed to play him in the movie. It was Ann Mark’s first day! Sounded tough, but remember, it was all because of things she didn’t do. T.J Miller accused of sexual assault from back in college. Dustin Hoffman accusers speak out in interview. David Letterman’s first guest on his new Netflix show will be… Malala? Jim Carrey has herpes & warns a producer not drink after him on Norm MacDonald LIVE. Rose McGowan going after Meryl Streep & her insincere Golden Globe gesture. #sheknew. Is anyone really surprised that Karen Spranger has a house of skank? A DFD fire captain has a suspicious car accident. Where there’s smoke there’s something. Am I right or what? Everything in this “Pizza Joke” story is stupid. So stupid that any responsible “news crew” would call the restaurant for comment. Today in Rock: Bill Clinton was impeached, Joan Baez arrested, Joe Walsh makes the Eagles somewhat tolerable, Walk Like an Egyptian is #1 on the charts & cultural appropriation and Eminem & Kim divorce again. 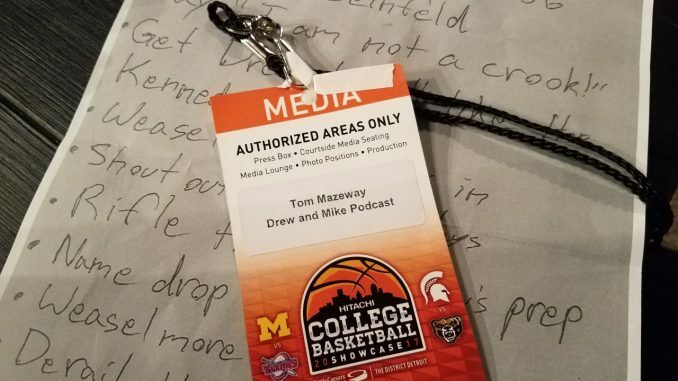 Tom jams in Show & Tell with the podcast’s first press credential. He immediately gets accused of hoarding parking spots. At least he completed his podcast “show prep” check list.